RisiLights & RisiSounds – High Tech Retaining Wall Blocks | OhGizmo! If you thought your meticulously landscaped back garden or patio was the one place you could escape from all the high-techery of everyday life, I’m afraid you’d be wrong. 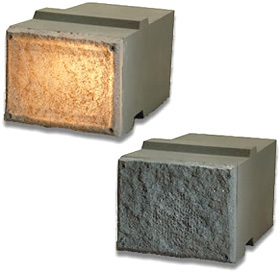 Thanks to a company called Risi Stone Systems, you can now install a retaining wall that features integrated lighting and speakers via these RisiLights and RisiSounds faux-concrete blocks. The blocks are actually made from a high strength fiberglass housing with acrylic faceplates, and are designed to blend in with standard concrete paving blocks so that they leave your retaining wall with a uniform finish. It looks like they can be installed as easily as standard concrete blocks, though you’ll have to plan ahead since the RisiLights blocks require a power cable, while the RisiSounds blocks need the appropriate audio hook-ups. Unfortunately at around $140 each, the RisiLights aren’t cheap, which foils my plans for creating an awesome pixel board retaining wall. And the RisiSounds blocks are even more expensive at around $175 a piece. Interesting stuff but impossibly expensive for general building use.